Check out our Tyrannosaurus rex facts for kids and enjoy a wide range of interesting information about this incredible dinosaur. Tyrannosaurus rex is possibly the most well known dinosaur due to its huge size, ferocious nature and regular appearances in popular media. Thanks to a number of well preserved fossils, the T-Rex has been studied in detail by paleontologists all around the world. ‘Tyrannosaurus’ comes from the Greek words meaning ‘tyrant lizard’, while the word ‘rex’ means ‘king’ in Latin. Tyrannosaurus rex is often abbreviated to T-Rex. Tyrannosaurus rex lived in an area of the Earth that now makes up western North America. Tyrannosaurus rex walked on two legs, balancing its huge head with a long and heavy tail that sometimes contained over 40 vertebrae. Tyrannosaurus rex measured up to 13m (42ft) in length, 4m (13ft) at the hip and could weigh up to 7 tons! The skull of a Tyrannosaurus rex alone measured up to 1.5m (5ft) long. The largest tooth of any carnivorous dinosaur found to this date is that of a T-Rex. It is estimated to have been around 30cm (12in) long when including the root. When Tyrannosaurus rex hit around the age of 14 its body size would increase rapidly, putting on around 600kg (1300lb) a year over the next 4 years. 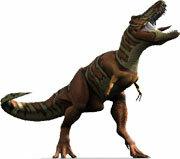 Tyrannosaurus rex had small arms that were extremely powerful and featured two clawed fingers. Tyrannosaurus rex lived in the late Cretaceous Period, around 66 million years ago. Because of the lack of concrete evidence, it is difficult for scientists to work out how fast Tyrannosaurus rex could run, with estimates ranging from as low as 17kph (11mph) to as high as 70kph (43mph). Average estimates suggest a max speed of around 40kph (25mph). There is also strong debate about whether Tyrannosaurus rex was a predator or scavenger. It had small arms which would have made it hard to grip prey, suggesting it may have been a scavenger. On the other hand, evidence in favor of it being a predator includes its forward pointing eyes which give better depth perception and make it easier to hunt. In 1997 the Field Museum of Natural History in Chicago purchased an 85% complete Tyrannosaurus rex fossil skeleton (nicknamed ‘Sue’ after its discoverer Sue Hendrickson) for 7.6 million US dollars, making it the most expensive dinosaur skeleton to date. Along with Stegosaurus and Iguanodon, Tyrannosaurus rex was one of three dinosaurs that inspired the appearance of Godzilla. Tyrannosaurus rex was represented in the popular Transformers toy line and animated series as Grimlock, an Autobot that could transform into a powerful Tyrannosaurus rex.